Alien Isolation PAK files have slight variants, there was the texture ones which I previously made a tool on and now looking into the model I’ve figured out that they share a common structure. When they mean package they seem to store only the core data inside them. 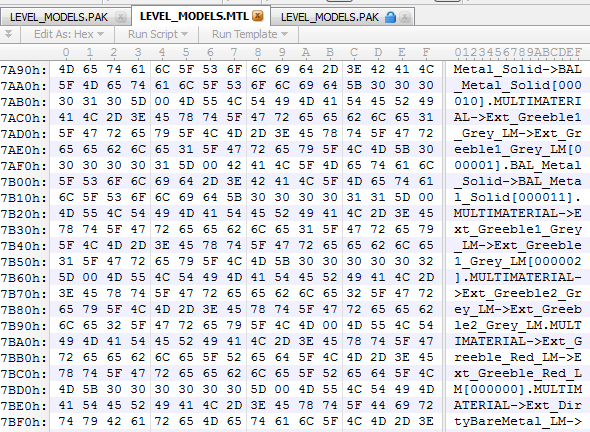 Lets take textures for example, you got your package file full of just compressed texture data then a linking header file containing the filenames and texture headers. Same sort of deal with the models packages except they store all sorts of strings in the accompanying file like bone names and such. This entry was posted in Main and tagged alien, assets, data, isolation, pak. Bookmark the permalink.